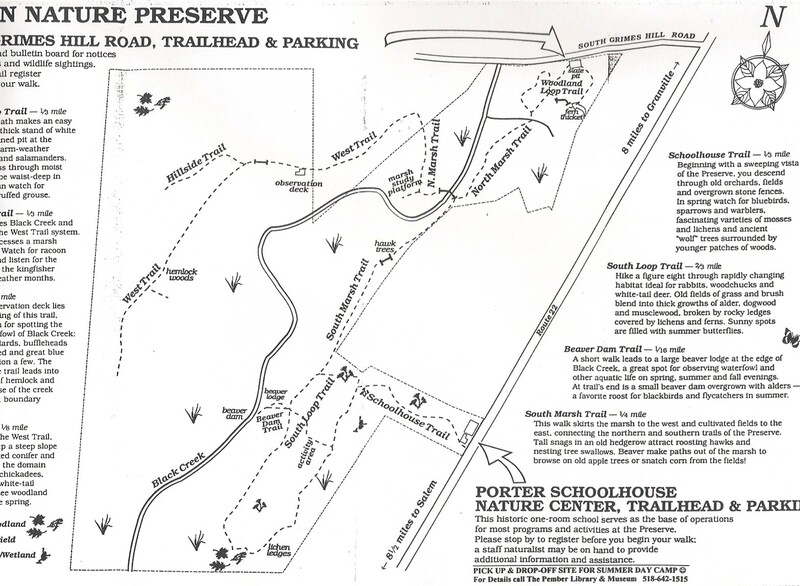 The Pember Nature Preserve (PNP), donated to the Pember Library and Museum in 1979, encompasses 125 acres of forest, wetland and fields on both sides of Black Creek, a tributary of the Battenkill. The mission of the Pember Nature Preserve is to provide a refuge for the region’s native wildlife and plant species. Over two miles of trails wind through the Preserve, marked by a system of blazes and wooden signs. Visitors to the marsh walk on elevated walkways and a footbridge is over Black Creek. An observation platform at the edge of Black Creek allows people to observe wetland wildlife. In 1987, at the Granville School District deeded the Porter Schoolhouse to the Pember Library and Museum for use as a nature education center. The neglected one room schoolhouse has been restored and has been in use as a classroom since 1990. The Porter Schoolhouse is one point of entry to the Preserve; the other is located at the south side of the Preserve on South Grimes Hill Road. The Pember Nature Preserve is located eight miles south of Granville on Route 22. The Preserve is under the umbrella organization of the Pember and the Museum staff function also as the Preserve staff. Seven nature trails are available for use at the Preserve, open year round from dawn to dusk. Individual walks range from .25 miles to almost 2 miles, varying from easy strolls to moderate hikes. Trail maps are available at both entrances to the Preserve and at the Pember Museum. No emergency telephone, toilet or drinking water facilities are available at the Preserve. Who’s photo is that? It is kind of eerie. It’s from our website and I think it’s a photo of the preserve in some spot or another, and I agree, it’s eerie with the fog and all.